In this piece, I strive to emulate the internal, yet often unseen, discord of those with mental disorders. The woman’s ornate necklace gives off the appearance of an affluent woman with superficial cares and desires. 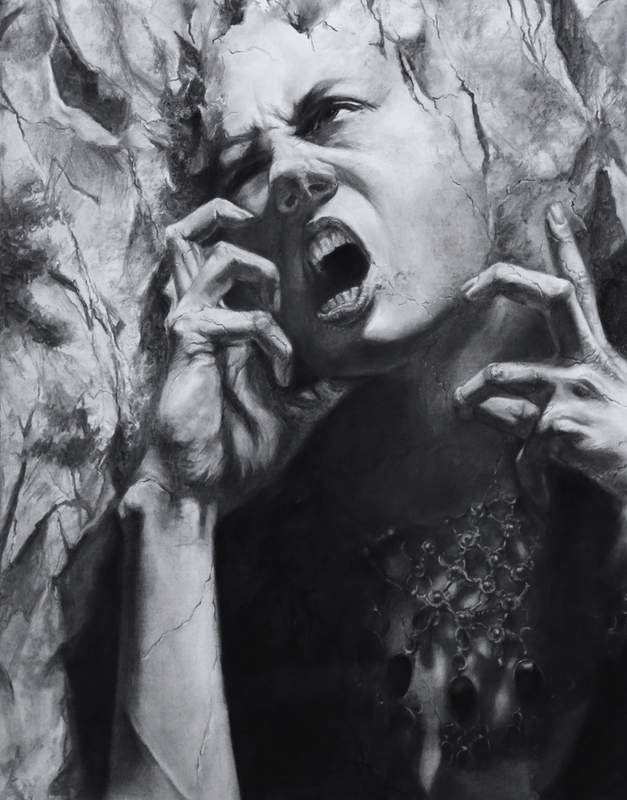 However, as screaming thoughts clamor for attention, cracks run through her face and hands like spidery veins, and her face contorts under the pressure of her expectations. The texture of the rocks contrasts with her detailed necklace while connecting to the cracked face in fissures and crevices. Thus, her face, instead of representing her outward appearance, represents an internal struggle and frustration pushing the girl to her breaking point. Often, society perceives physical disabilities and illnesses as more important or more severe than mental diseases. This piece challenges the appearance of ease, represented with a perfectly intact, lavish necklace, by highlighting the contorted visage behind a rough background.